Which House? Gryffindor? After all, they’re known as the most courageous wizards at Hogwarts. How about Ravenclaw? Everyone knows that Ravenclaw students are creative and smart as a whip! What about Hufflepuff? Don’t count them out! They have a hardworking and honorable nature that can get them through anything. Of course, there’s always Slytherin. They may have turned out a few dark wizards, but they are ambitious and cunning! It sure is tough choosing which House from Harry Potter to join—they all have some awesome qualities! 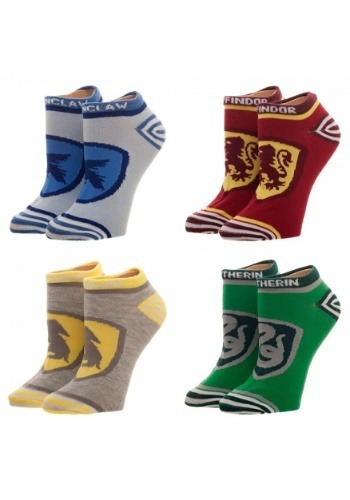 Well, these Harry Potter Crest Ankle Socks will help you try out all of the Hogwarts Houses to see how they feel. These officially licensed juniors socks come in a pack of 4. Each design is unique to the House—there’s one for Gryffindor, Ravenclaw, Slytherin, and Hufflepuff. Each one is made out of a spandex and polyester blend for a comfortable fit. Whether you’re just trying to figure out which Hogwarts House feels like you or you want to add the finishing touch to your Harry Potter-themed cosplay costume, this 4 pack of socks makes for a great addition to your wardrobe. It’s an easy way to show your Hogwarts school spirit!